If you are looking for practicality and power in a car that is not too expensive, then the BMW 330i GT tuning project is the perfect solution for you. The fastback body style adds a huge access to the boot space and increases cargo capacity, while elongated wheelbase gives more room to the rear passengers, allowing even space for three full-size seats in the rear. The facelifted version produced from late 2016 also offers a number of engines, both petrol and diesel ones, ranging from 150 hp in a four-cylinder 318d to 326 hp in the six-cylinder 340i. Of course, as the power rises, so do the purchase, maintenance, ownership and servicing costs. However, ZIP Tuning has found a way to give you six-cylinder power in a four-cylinder pack. Our project for the BMW 330i GT tuning turns this sensible, practical family car with a four-pot engine into a beast that matches or even exceeds the power of six-pot ones. The particular vehicle we worked on was a 2017 BMW 330i GT and the owner wanted a simple but effective and reliable solution from out tuning for BMW 330i GT. All the changes are done on the software of the OEM ECU and they are completely safe for the ECU, engine and all other parts. We’ve recently tuned a BMW 230i with the same engine and the results are quite similar, although we did manage to squeeze a bit more power from the 3 Series GT. 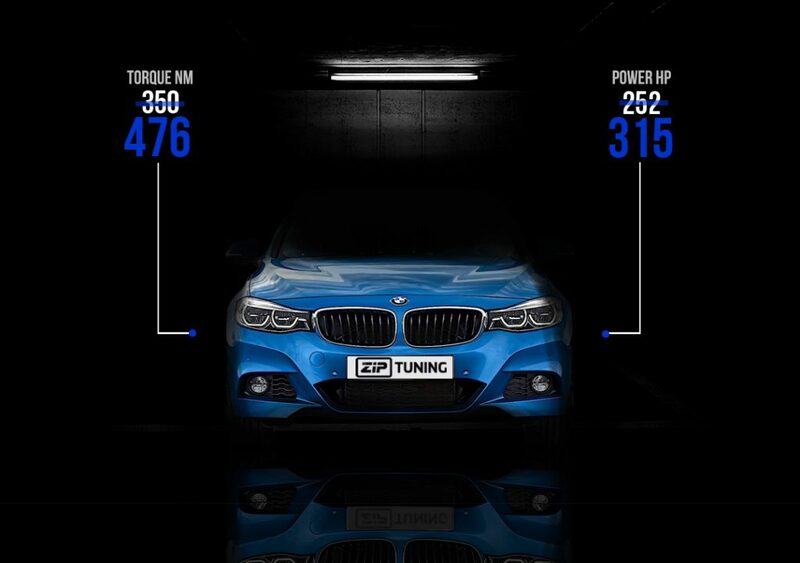 After ZIP BMW 330i GT tuning the total power and torque rose to 315 hp and 476 Nm of torque. These figures are remarkable in their own right, but there is more to it than the numbers show. The first thing we do is an adjustment in forced induction pressure. This is done by adjusting the software of the ECU and the result of this change is that more air is sent into the engine. This is a step that makes more room for all other adjustments and ultimately results in more power, but also a noticeably better feel when you press the pedal. The second adjustment is an increase in fuel delivery. It is of the highest importance to keep the air-fuel ratio at its stoichiometric level. This means that for every increase in the amount of air sent into the engine, we also need to adjust the amount of fuel delivered. This ensures the increase in power, but also provides good combustion. The resulting increase measures the top power figure of 315 hp and the top twisting force of 476 Nm. This comes very close in terms of power to the 340i GT which boasts 326 hp and it even surpasses the six-cylinder beast in terms of torque. Add to this the fact that the smaller engine also means less weight at the front and the ZIP tuned BMW 330i GT becomes a far more interesting machine to drive. Adding such power to the 2 l engine means that you can make use of the extra horsepower without putting up with the fuel consumption of the six-cylinder engine and its higher maintenance and servicing costs. It is very important to stress the level of testing we perform. We meticulously test and perform data logging to ensure that nothing is left to chance. In spite of the noticeable increase in power, all the stock parts are within safe boundaries and there is no worry that anything will go wrong with the car because of tuning. This testing is especially important for the next step in our stage 1 BMW 330i GT chiptuning. This final step is an adjustment in ignition timing. Ignition timing is advanced to the earliest safe point for each RPM section. For example, in lower RPM, we advance ignition timing to give a more immediate response from the engine. As the cylinder pressures rise with the RPM we ease back a bit on the ignition timing advancement and, as the power and torque start falling, we advance it a bit again. This results in a remarkably wide range where top torque is available and it allows us to follow the torque delivery line of the smart engineers from BMW. 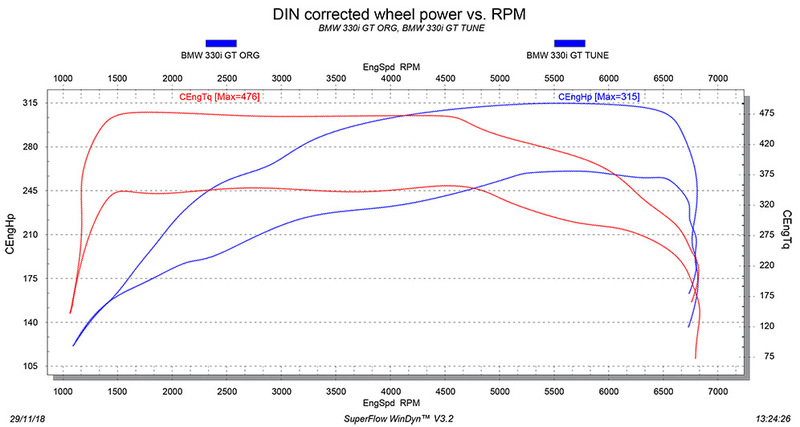 As you can see, our power and torque curves are very similar to the OEM ones, just on a much higher level. We offer safety and quality, additional tuning stages that result in far more power and tuning projects for almost all vehicles. Contact us for more information or, if you are a tuner, register on our website for free and make use of our expertise.